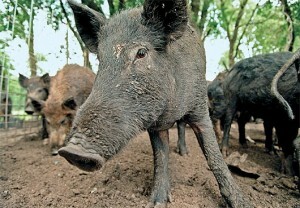 Feral Pigs, which are often interbreed with wild boar, is difficult to distinguish from natural wild boar. This is because the appearances of these two species are quite common. Domestic pig can become Feral quite readily. 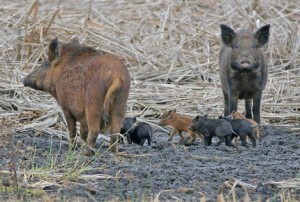 How to control the population of Feral Pigs? These pigs are usually dark grey, black or brown in color. They have fur coats which are much thicker compared to domestic ones. The fur of this species becomes much denser in winter. They have longer legs than the domestic breeds. Feral tends to have longer and narrower snout. Males develop tusks which serve as a weapon. The upper tusks, with sharp edges, are bent upwards. The tusks can be around 5 – 7 cm though it can go up to around 10cm at times. Females have sharp and pointed canines, small in size. 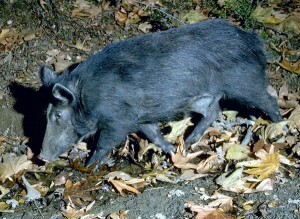 The largest populations of the Feral Pigs are primarily found in most part of the United States. Apart from the US, it also found in some countries of South America. Few species of this animal can also be found in Europe, Asia and Australia. The population of this species can go rapidly. It is able to have two litters in one year and each litter can consist of 9 – 10 offspring depending on the environment. Piglets reach their sexual maturity within around 8 months. The reason of such a huge population may be because of the absence of natural predators in their habitat. Since these animals are omnivorous, it gives them a wide range of choice. It feeds on different kinds of plants and animal food resources, such as small frogs, salamanders etc. At times, this cunning animal also preys on eggs of ground nesting birds such as turkey or quail. 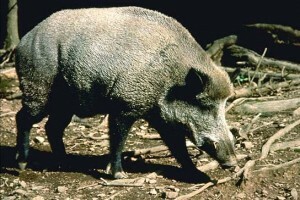 The population of this pig increases with increase in its geographical distribution. The ever growing population of this species is well established. In United States alone, the total population of this species is at least 4 million but it can be much more as it is almost impossible to count. Texas has the largest population of this species, which is approximately over 1 million, followed by California, Hawaii, and Florida. Feral Pigs are found in 39 states across US. Many suggest that the population is increasing because of illegal and ill advised translocation. 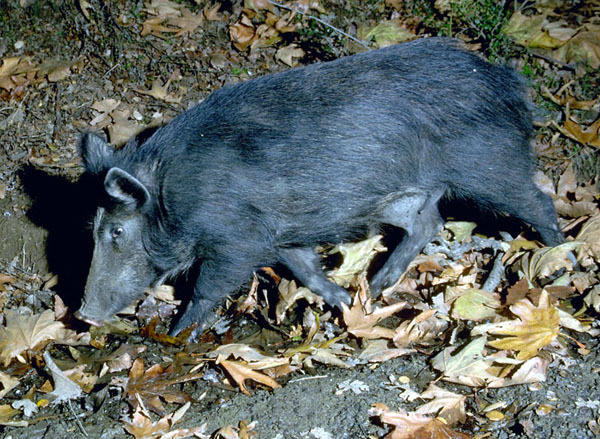 Landowners or farm owners should make sure that they do not bring in or shift any Feral Pigs for hunting or other purposes. In case they spot any pig of this species, the owners must immediately contact the concerned authority so that they can take necessary actions. The only way to control the population of this animal is hunting. The hunter must have a license and the permission of the landowner/ concerned authority to hunt this prolific animal. Concerned authorities related to this problem are using several techniques to destroy the population of this animal. These include hunting, trapping and poisoning. Several states in the United States have declared this species as invasive due to its problematic nature. Most of these states have reduced the hunting regulations on Feral Pigs. The Virginia department of Game and Inland Fisheries and The Missouri Department of Conservation encourage hunters to shoot this animal as many as possible. In densely populated states such as Florida and Texas, traditional hunting, trapping, shooting from helicopters and night shooting have been introduced to reduce the population. Since public hunting effort is failing to curb the population of this species, many federal agencies are launching new efforts involving use of cage traps to get rid of this animal. The trapping method is used only in those ranges where the density of this species is high. Some prefer trapping because it is the safest and the cages can be used more than once, which makes it economical. Some people dislike this method as this technique can be costly and time consuming. Since some pigs are trap shy, this method is not useful all the time. Normal feeding should not be stopped prior to the activation of traps. The trapping area should look as natural as possible i.e. the pigs must not sense anything negative. The cage should be made with heavy metal and the size of it trap should be according to the size of the animal and favorite pig foods should be used as bait. Anyone who wants to catch more than one animal at a time should use a large cage. One must check the trap regularly. Apart from trapping, poisoning is the most useful and popular way to control the population. Here are some interesting facts on Feral Pigs. In June, 2004, a very large hog popularly known as Hogzilla was shot in Georgia, United States. First it was thought to be a hoax. After performing the DNA test it was determined that this so called Hogzilla was a hybrid of wild boar and domestic swine. In New Zealand, these pigs are popularly known as “tuskers” and “Captain Cookers”. In Virginia, it is illegal to release these pigs in the wild as it is classified among the nuisance. 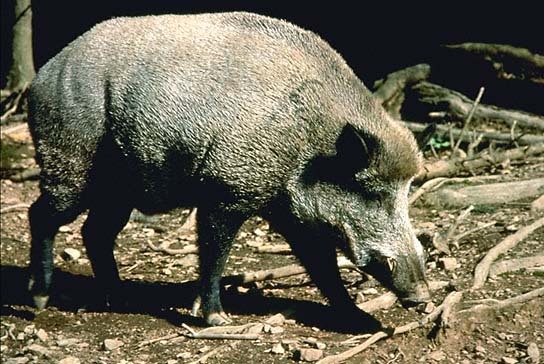 According to some historians, hogs were brought by explorers to the United States from Spain in late 1500s. In the southern part of the United States, where it is very easy to find, it is popularly known as “Razorback”. In some parts of Brazil, licensed hunting of this species were allowed from 2005 – 2008. But in 2010, such licensed hunts were forbidden by IBAMA. This species is troublesome in many ways. It can cause damage to vegetation. Members of this species rout and trample on agricultural fields and actively feed on existing crops. The biggest problem with this species is that it carries virus of different kinds of disease. Human can get a disease called Swine brucellosis, if they come in contact with its blood or any bodily fluids. Hunters and butchers may be at risk of infection with this disease. Feral Pigs are certainly a problem in the areas it ranges. To control the population of this animal all the departments related to this should work together and as far as hunting or trapping is concerned, it should be done with proper permission taken from the concerned authority, if necessary.